The FTD All Things Bright Bouquet offers warmth and comfort to your special recipient during this time of loss and grief. 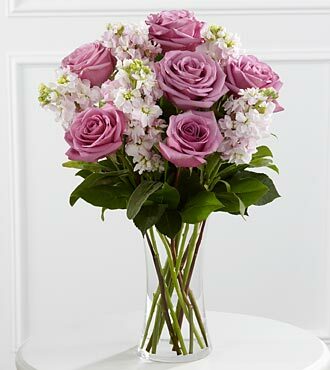 Gorgeous lavender roses are arranged amongst fragrant pink stock and lush greens, seated in a clear glass vase, to create a bouquet that beautifully conveys your deepest sympathies. STANDARD bouquet includes 11 stems. DELUXE bouquet includes 16 stems. PREMIUM bouquet includes 21 stems. Approximately 20H x 15W. Your purchase includes a complimentary personalized gift message.